Could be good news for Pollock fishery. In 2014 the Bering Sea warmed, raising concerns that pollock populations would plummet as they did in the previous warm phase of 2001-2005. But a new study suggests that this time young pollock had alternative resources that weren’t available during the last warming phase to help buffer ill effects of warming. With 2017 showing signs of cooling, pollock populations may have successfully weathered the warm years of 2014-16. Walleye pollock supports one of the world’s largest fisheries and produces the biggest catch of any species in the United States. However, dramatic swings in pollock recruitment (the number of fish that reach a size available to the fishery around 3 years old) pose challenges for the fishery and fishery management. These fluctuations are driven by effects of changing environmental conditions on survival of juvenile pollock. Understanding how young pollock respond to changes is crucial to predicting recruitment and sustainably managing a profitable fishery. Sea ice is important in many ways--one is the suite of energy-rich plankton that accompanies it. The reason it’s warm matters-- and years 2014-2016 were warm for different reasons than 2001-2005. Pollock will find feeding opportunities if they exist--and they did in 2014-2016. Juvenile pollock need energy-rich prey to survive winter in the Bering Sea. “We knew that sea ice and high quality food for young pollock were connected, but it wasn’t clear how,” says Duffy-Anderson. “Now we know that Arctic algae are attached to the sea ice. When the ice melts, these algae are released into the water column to be eaten by large, oil-rich zooplankton, which are in turn eaten by young pollock fattening up to prepare for the Bering Sea’s harsh winter. This chain of events is critical to pollock success.” Some warming mechanisms affect this chain of events more than others -- not all warming events are the same. The 2001-2005 warm stanza set in motion a cascade of ecological changes that resulted in a decline in the number of walleye pollock, ultimately leading to a 40% reduction in the fishing quota. Those years showed characteristics typical of warm years in the Bering Sea: weak winds from the north, lack of sea ice, and warm ocean bottom temperatures. Under those conditions the plankton community gradually transitioned to small, low-fat plankton--inadequate nutrition to provision young pollock for winter. Sea ice eventually returned to the southeast Bering Sea shelf, ushering in a new stanza (2007-2013) of cold sea temperatures and large, oil-rich prey. By 2013, recruitment to the pollock fishery had recovered completely. 2015 proved to be even warmer than 2014--but the reason it was warm was something not seen before. 2015 acted like a cold year: strong winds from the north pushed Arctic sea ice southward to the southern Bering Sea. But then sea ice met the Blob. Sea ice was stopped in its tracks by a mass of warm water invading the Bering Sea from the Gulf of Alaska—“the Blob”. Warm Blob water melted sea ice before it could go any further, keeping the waters of the southern Bering Sea shelf very warm and unproductive. However, as sea ice retreated it left a “cold pool” of meltwater with a suite of Arctic algae and energy-rich zooplankton behind. By 2016, winds from the Arctic were again weak, sea ice absent, and water very warm over the southern shelf. The cold pool had shrunk and retreated far northward, becoming unavailable to young pollock seeking refuge. Large copepod prey were scarce. 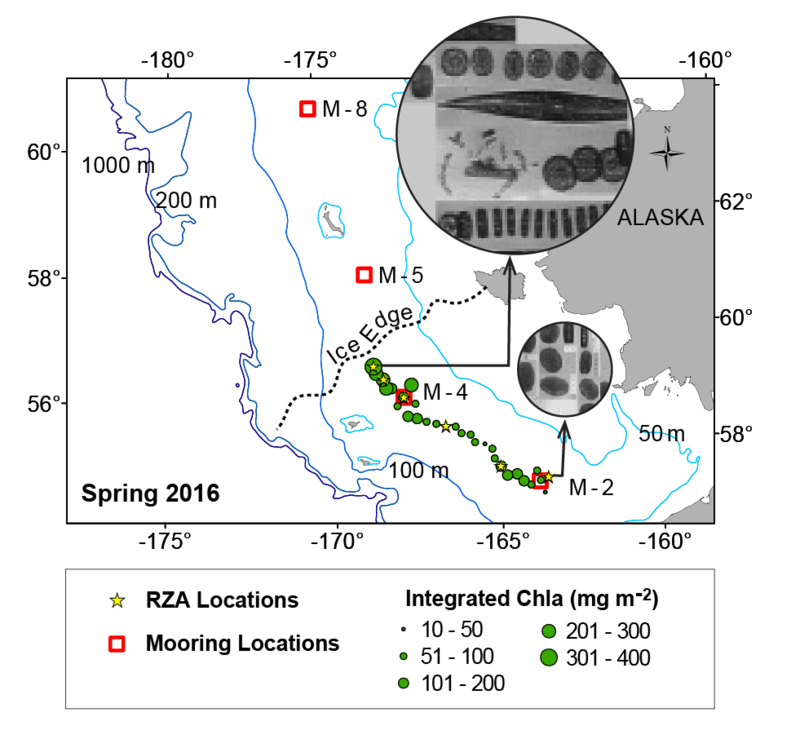 Yet high-energy krill remained over the southern shelf--possibly remnant populations from 2015. The number of pollock that survived their first year in 2015 was higher than expected for a second consecutive warm year, based on surveys of fish in their first year of life. This could mean good news for the fishery, and suggests that young pollock found food resources despite the warm, unproductive conditions of the southern Bering Sea shelf. In 2016, pollock may have found another way to buffer warm ecosystem effects. 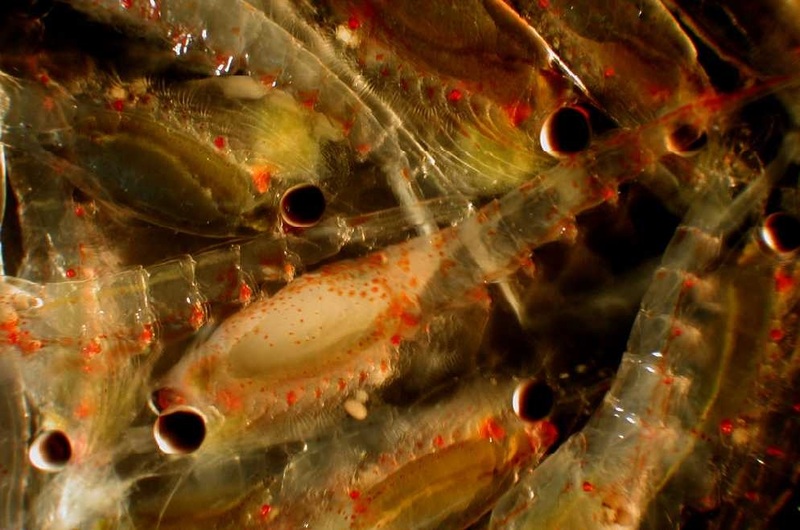 “Pollock consumed large numbers of krill, possibly remnant populations from 2015. This suggests that in 2016 pollock found another way to survive: switch prey sources,” Duffy-Anderson says. “We don’t have estimates of overwinter survival for the 2016 cohort yet, but our data indicates it could again be level, which is surprising during a third consecutive warm year,” says Duffy-Anderson.